The Joint Center’s new report – America’s Rental Housing: Expanding Options for Diverse and Growing Demand – highlights the now familiar trend of increasing affordability pressures facing renter households. As of 2014, just under half (49.3) of renters were housing cost burdened, spending more than 30 percent of income on housing costs. This share includes more than one-quarter (26.4 percent) of renters who were severely cost burdened, spending more than half of their income on housing. The burden percentage rates remain near their peaks reached in 2011. 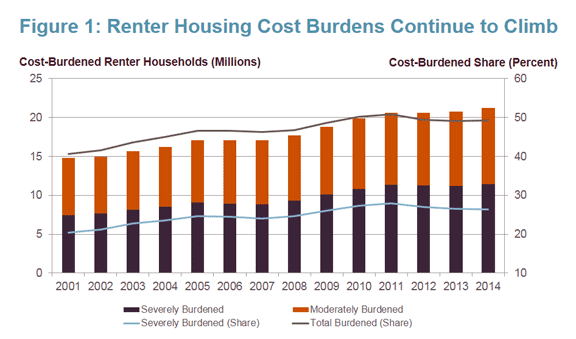 In total, 21.3 million renters were cost burdened in 2014, 11.4 million severely so, both all-time high numbers. Notes: Moderately (severely) cost-burdened households pay more than 30% and up to 50% (more than 50%) of income for housing. Households with zero or negative income are assumed to have severe burdens, while households paying no cash rent are assumed to be without burdens. Our interactive map series, released in conjunction with America’s Rental Housing, illustrates that renters across the country are experiencing housing cost burdens at high frequencies. In the nation’s 917 metropolitan and micropolitan statistical areas, the cost-burdened share of renters ranged from about one-quarter to nearly two-thirds in 2014, with between 40 and 50 percent of renter households housing cost burdened in the typical metro. 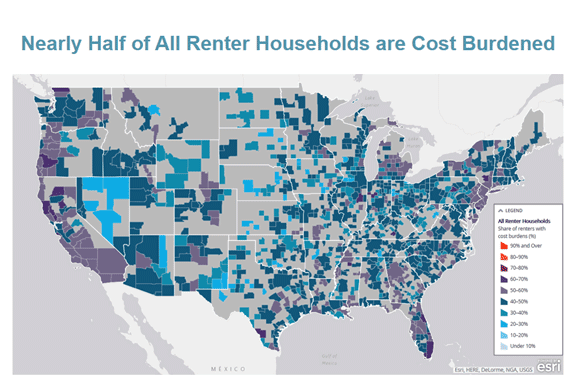 Over half of renters were housing cost burdened in more than 200 metro and micro areas. Among these highly burdened localities are some of the nation’s largest metros, such as Miami, Los Angeles, New York, Philadelphia, and Atlanta. Also highly burdened were many smaller areas either with particularly high housing costs, such as Santa Cruz, Key West, Juneau, and Olympia, or with significantly lower incomes, such as Laredo, TX, Monroe, LA, Las Cruces, NM, and Flint, MI. The link between low incomes and high cost burdens is evident across the country, and for those with the lowest incomes, housing cost burdens were nearly unavoidable. Among renters with household incomes under $15,000 per year – equivalent to full-time work at the federal minimum wage – just under 84 percent were housing cost burdened nationwide in 2014. Rates reached upwards of 90 percent in over 100 areas both large and small – Denver, Los Angeles, Dallas, Milwaukee, Walla Walla, WA, Sheboygan, WI, and Grand Forks, ND – and were above 50 percent for all but two small micro areas – Beatrice, NE and Ardmore, OK. Even among middle-income renters with household incomes between $30,000 and $45,000, housing cost burdens are widespread. Nationwide, about half (48.4 percent) of households in this income group were cost burdened in 2014. Burdens for this group were especially high in several pockets across the country, typically in areas with especially high-cost housing. Upwards of 55-60 percent of moderate income renter households were cost burdened in metro and micro areas along both coasts, near major interior population centers such as Chicago and Atlanta, and in areas across Texas and northern Colorado. 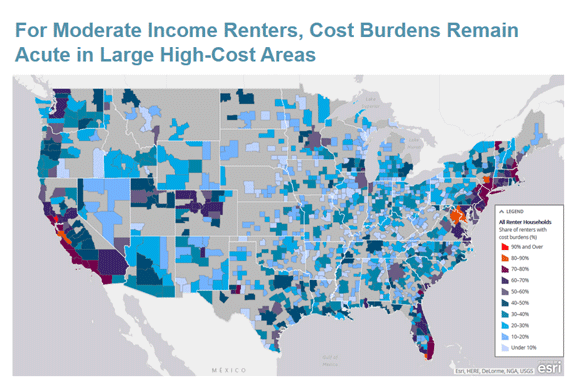 These data show that, across the country, housing cost burdens are no longer a problem only faced by renters at the bottom rung of the income ladder. Indeed, their prevalence among moderate income renters is growing rapidly. Between 2001 and 2014, a time of strong growth in renting, the number of renter households with incomes between $30,000 and 45,000 increased by just over 13 percent. At the same time, the share of renters in this income group with housing cost burdens rose 11.5 percentage points from 36.9 to 48.4 percent, the largest jump among any income group. As a result, the number of moderate-income renter households with housing cost burdens increased by over 48 percent between 2001 and 2014. This dramatic rise underscores the growing affordability challenges facing America’s renters during a time of increasing demand for rental housing. The dynamics of this demand, along with the supply response, market conditions, and policy challenges facing today’s renters, are explored in more detail throughout America’s Rental Housing.